Categories: Christmas, Family, Transitions, Uncategorized | Tags: Christmas, Christmas letter 2018, inspiration, Parenting, Transitions | Permalink. Categories: Endings, Family, Home, Transitions | Tags: Family, lifestyle blog, moving, moving advice, saying good-bye, Transitions | Permalink. Dad holding me when I was just a day old! One of the most comforting words shared with me during this time of grieving for my Dad was, “Your Dad was the first man who held you on his arms and said, ‘I love you.’ ” This first photo is the first photo I have of my Dad holding me. It is so comforting that Dad got to hold my son as well as me. 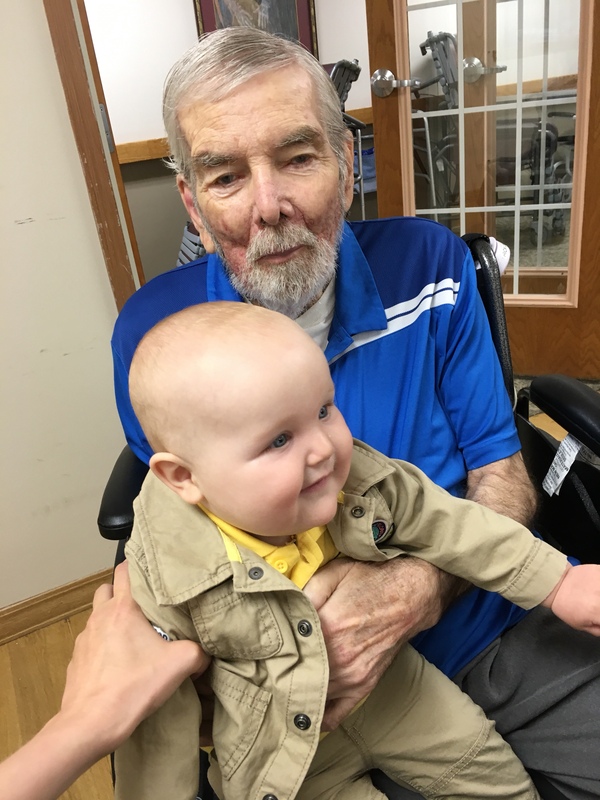 On June 6th, my son and I went to see my dad. He was dressed in a nice blue shirt and was sitting in his wheelchair in the living room with a lot of other folks who were dozing and quiet. He seemed sleepy, but he perked up when he saw us. His eyes crinkled into a smile and he knew who we were. I gave him a hug and then got Joel out of his car seat, and then Dad reached out to hold Joel! Dad smiled at Joel And Joel smiled back. Dad held him for about five minutes until his arms got tired (Joel weighs around 25 lb. already), and then he handed him back. Dad holding Joel 36 years later. Categories: Family, Fathers, Grief, Transitions | Tags: Family, Grief, Pregnancy, processing grief, Rick Campbell's funeral, Transition | Permalink. Taught me how to sew, and that we made that blue and green apron together. You were tired, but I loved making that special project with you. Categories: Family, Mother's, motherhood, Thankfulness, Transitions, Uncategorized | Tags: Mom, Mother's Day, parenthood, Parents, thankful for my mom, Transitions | Permalink. This is when our son first met Sherpa on March 20th with his Aunt. Sherpa, my brother and sister-in-law’s golden retriever, brought sunshine to the room (plus a lot of woofs!) She loved to greet anyone who came into the door with great barks and happy commotion—her joy of seeing you made you feel even more welcome. Categories: Family, Grief, Pets, Transitions, Uncategorized | Tags: Family, Grief, losing a pet, saying goodbye to a dog, Transition, Transitions | Permalink.